Product #21236 | SKU 346205 | 0.0 (no ratings yet) Thanks for your rating! 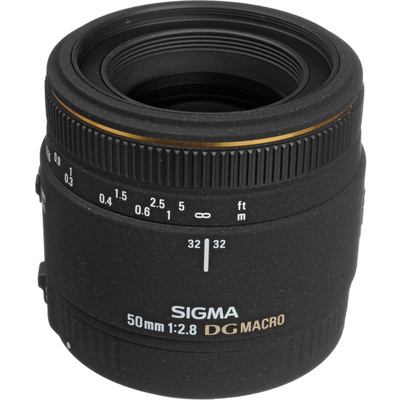 To maintain high optical performance from infinity to close-up 1:1 macro photos without accessories, the Sigma 50mm f/2.8 EX DG incorporates a "Floating Internal Focusing" (FIF) system. As a result, the lens also features a non-rotating front lens group which makes it easier to work with polarising filters, and has a focus limiter to narrow down the broad focus range. And the improved minimum aperture of f/45 now provides improved depth of field. This lens is designed as a high-quality primary macro lens, good for film or digital SLR cameras. The improved DG lens design corrects for various aberrations. This macro lens is specially coated to get the best colour balance whilst cutting down on ghosting caused by reflections from the digital image sensor. The lens provides the utmost correction against lateral chromatic aberration which is a serious problem for digital SLR cameras.